Unfortunately, the low price was good, the moulding style was good, the delivery was good, but the workmanship was sloppy. Corners not mitered well, and the frame opening was not square. I had to modify my canvas stretcher to get it to fit. I didn't have time to send it back and wait for a new one. Hello Jobyna. Thank you for contacting us. We’re so sorry to hear your frames were not in satisfactory condition when your order arrived. If you have any concerns with your order, please contact us. We’ll be happy to send you a replacement order at no cost to you, or we can process a refund or company credit. We accept returns for all items except Outlet Shop frames. 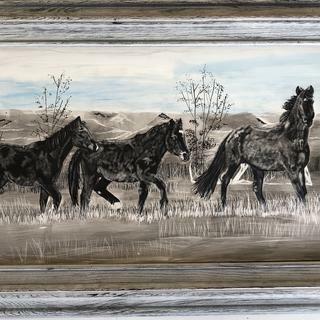 If an item ordered from us (for example a frame) simply doesn’t suit your artwork, or the corners are not mitered well, we can gladly accept a return against an order within 45 days of the order date. The sale prices are nice. 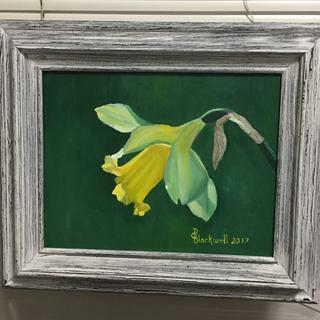 I use frames that are not always standard sizes. I do find that the included clips do not always stay in place. 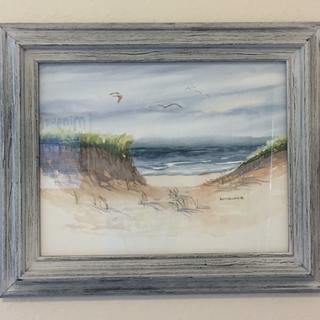 This was exactly what I wanted for this Cape Cod beach scene painting. Rustic, but not too. Lovely light gray gives it a real beachy feeling. Exactly as pictured - perfect with the acrylic in front of my piece. 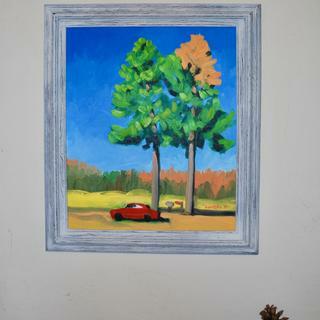 I wanted a frame that could express my feelings about the death of more than a million pine trees in California. 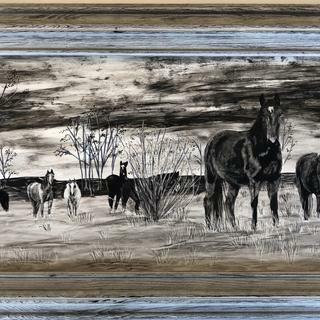 This frame, with its weathered look and slightly warm gray tone, seemed a perfect counterpoint to my saturated use of color. I was so delighted with the first few, both in their ability to reinforce the overall tone of my work and the quality of their manufacture, that I have now bought more. Pictureframes.com (Graphik Dimensions) is my #1 go-to shop for frames and matting. 8/17/16, Oil on canvas, 24" x 30"
Another great piece, I will definitely be back to buy all of my frames. The color of this frame is misnamed. It should be named Bluewash rather than Whitewash. The frame was too blue for its intended purpose, which was to frame a painting which featured an antique white figure. However, it nicely framed a blue accented painting. Hello Jack. Thank you for placing your recent order. We sincerely apologize for the inconvenience. At your earliest opportunity, please return my call so that we may discuss exchanging the frame for a true whitewash frame. We want to make sure your are 100% satisfied with the order, and using the frame for it's intended purpose. Thank you again for your business. Good frame, sturdy, Lightweight. Easy to install photo and hang. Enhances my coast and boulder photo. Very impressed! Very happy I found you. Frame came surprisingly fast- packed beautifully, great quality, love this frame! Already ordered two more. Will continue to do business with this company! Thank you! Arrived quickly and well packed. Just as pictured and described. This is the forth time I've purchased these frames as we like their looks and construction. I was truly impressed by these frames. They matched my artwork to the “T”. Works for me with the 20 percent discount but a little pricey for the quality. Gray wood with a weathered look seems complementary to a sea scene with a lighthouse, waves and gulls in view. I live in a coastal community. Weathered wood is always popular here. The shape fits my 1/2 inch canvases perfectly! The Art itself is 48”x36” tall 1” thick or deep do you carry that size and very heavy it’s on board?? Thank you for your inquiry. Unfortunately, this frame has a rabbet of 3/8" meaning it won't accommodate your 1" thick artwork and have the back be flush to the wall. 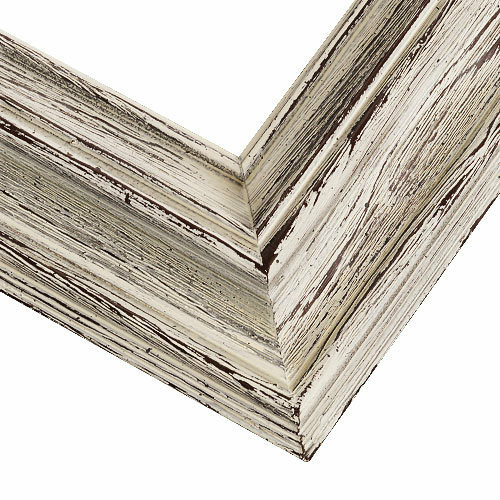 On this page https://www.pictureframes.com/Deep-Depth-Picture-Frames you will find frames with deeper rabbets (3/4" - 1 1/2"). If you have any additional questions do not hesitate to contact our framing experts at 1-800-332-8884. I don't believe this particular style frame comes as custom …. simply said, if the web site doesn't allow you to price out the size you need than it's probably not available. Plus if the piece is truly 1" thick than the frame's Rabbit has to be at least 3/4" or more to securely attach the piece in the frame. How may I get a larger size. I need 48X48.? BEST ANSWER: This 4RA frame is a Ready-Made frame and only comes in a max size of 28"x28".